Each year members of the Red-tail Recovery Team and volunteers collect a range of information/data to monitor, identify and assess trends in minimum population size, habitat-use, breeding success, and stringybark productivity. This information helps us to measure how the Red-tail population is performing. 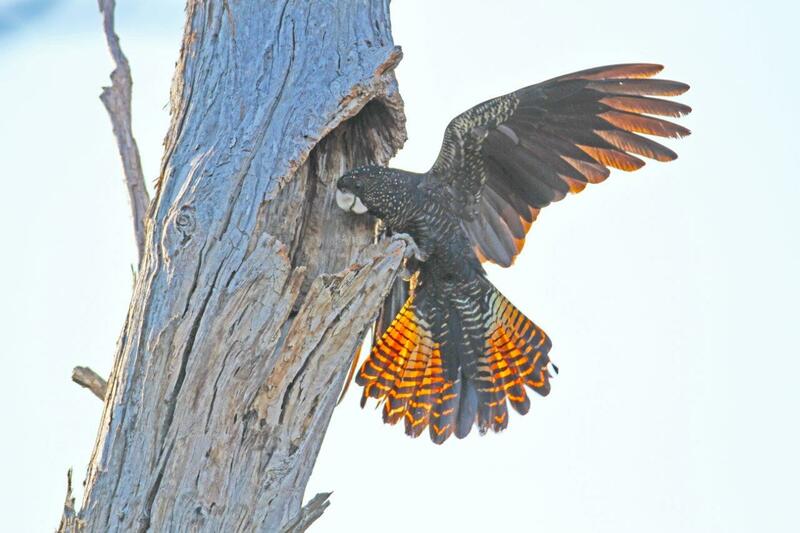 long-term seed crop monitoring of 200 stringybark trees at 10 sites across the Red-tail range as part of the long term phenology study to gain an understanding of the relative productivity of stringybarks (or food supply for cockatoos) on a yearly basis, in different parts of the range. 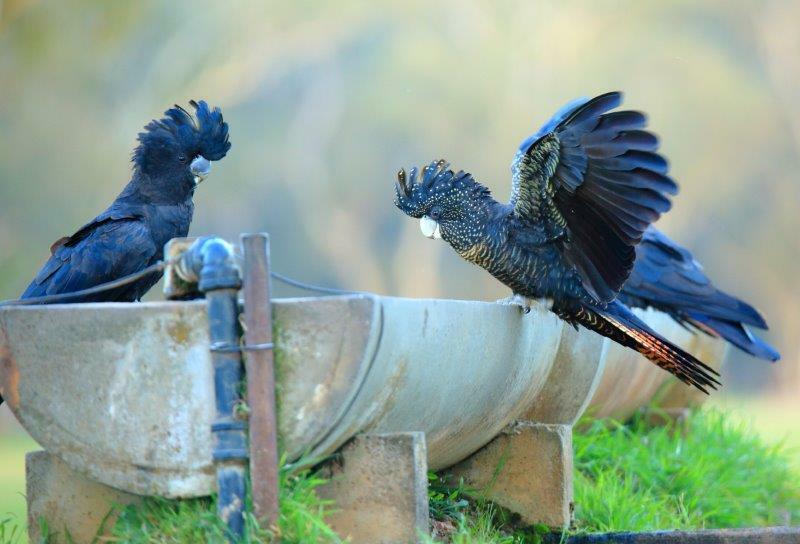 This survey also highlights the difference in the timing of seed production between the two stringybark species, identifies years of high and low food availability and enables us to make predictions on where the cockatoos are likely to target for feeding. The annual count provides the only measure of minimum population size, and more importantly helps us to identify the location of large flocks for completion of annual flock-ratio counts. Flock counts are done in autumn each year (following the annual count) to gain an indication of breeding success in previous seasons. This involves counting the proportion of adult males to adult females and juveniles. Because young Red-tails are indistinguishable in the field from two and three-year old birds and from females of any age, we count the number of adult males in each flock. 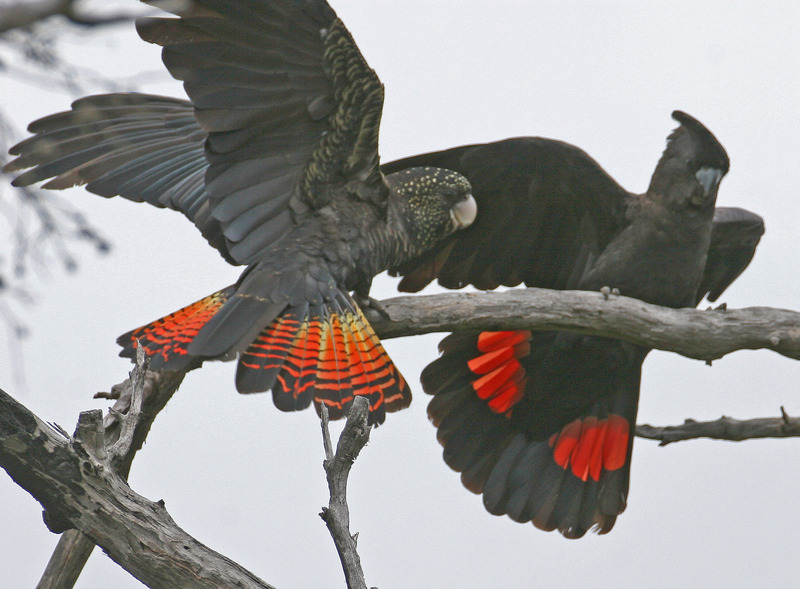 Adult males are recognisable by their uniform black colour and blood red tail feathers. All other Red-tails are spotted and barred, with barred tail feathers. The proportion of adult males in flocks in autumn varies from year to year, according to how many young birds have been produced in the preceding breeding seasons. Because we cannot differentiate adult females from juveniles we must assume an equal ratio of adult females to adult males when analysing the results to determine the proportion of juveniles in the flock. This is consistent with other species of cockatoos, where the ratio between the sexes is roughly 50:50. Therefore, if a flock has 39% adult males, then it is assumed that the flock also has 39% adult females. Hence, the flock is assumed to comprise 78% adults and 22% juveniles (birds less than four years old — males assume the adult plumage at 4 years of age). Hence, the lower the proportion of males counted, the better the breeding outcome. Flock counts have shown us that the breeding seasons of 2004-05 and 1998-1999 produced far more young birds than any intervening years. In those two years flocks contained an average of 37% adult males in autumn. The analysis of flock count-ratio and food availability data has shown that the proportion of adult males has increased with time and that the most important predictor or factor affecting the proportion of males was the amount of stringybark fruit available three years prior to the count. These results confirm that breeding success and population size is limited by food availability.